Choose any of the topics below to get started! On the Go See Campus home page (goseecampus.com), choose “Create a free account”. How do I sign in and sign out of my account? Select the “Log In” link at the top-right of your screen to sign in. To sign out, click “Logout” at the top-right. Contact us if your question isn’t answered here. How do I change information in my account, such as my email address? Go to “Settings”, which can be found at the top-right of your screen. The “Settings” page allows you to change your email address, password, and other information. Is my information available to other users? How can I participate in the Go See Campus Community while maintaining my privacy? When you register for the Community, you create a Community Name. The Community Name is an alias that appears in place of any personal information. For example, Jane Smith might choose the Community Name “BlueSky”. As a result, other users will only see “BlueSky”, not “Jane Smith”, next to her submissions. If you prefer to use your real name as your Community Name, remember that content you post on Go See Campus is available to all users, including reviews and comments you make about universities. How can I communicate with other members of Go See Campus? In the Go See Campus Community, you can use private messaging to exchange notes with other members of the site. When you use private messaging, neither your email address nor the email address of the person you are writing will be shared. You will only see the Community Name of the sender and the recipient. Please follow all community guidelines <> when using private messaging. How can I prevent other members from emailing me? Navigate to the Go See Campus Community. At the top of your screen, click “Welcome, YOUR NAME”. Press “Update Profile”. Private messages may continue to appear in the Community area, but you will no longer receive emails. What do I do if I receive an inappropriate message from another member? If you receive an email that does not follow the community guidelines, please contact Go See Campus. Provide the Community Name of the sender and the body of the message you received. We will review the situation and respond as needed. Members are prohibited from spamming or sending commercial messages through our system without our authorization. How do I stop receiving messages from Go See Campus staff? We communicate electronically with our users through two types of emails: mandatory system-generated emails and optional emails. System-generated emails are a direct response to a user's action on the site. Optional emails are selected by the user based on specific services chosen. We know that not everyone wants to get information in our optional emails, so you have the ability to opt out, either when you register for Go See Campus initially or by signing in, going to your “Settings” page, and managing email subscriptions. Which colleges does Go See Campus include? Go See Campus is adding colleges and features all the time. Currently, we focus on four-year undergraduate colleges and universities in the United States that hold the greatest interest for our users and offer a variety of majors or highly-regarded programs. If there is a college you would like to see added, feel free to contact us, and we may add it to our queue. What does it mean when a college is "In Development?" Some colleges on our website display a standard Go See Campus logo and are marked with the label "In Development". For many universities, we offer profile information about the school and link you directly to admissions resources and activities. Schools that are "In Development" provide profile information only, as Go See Campus has not yet added links to admissions resources and activities. You can still plan campus visits to these and all other colleges in the Go See Campus website. If you are a university representative and you are interested in moving your school more quickly from "In Development" status, please contact us. Why can’t I find the college I want? Your search terms may have been too specific. For example, if you searched “University of Klein”, and the college’s name is listed as “Klein University”, it may not appear in your results. How do I refine my criteria for college searches? To find colleges based on specific factors, such as region or majors offered, select the criteria on the “Search for Colleges” page, and click “Search”. How does Go See Campus find schools when I search by test scores, such as SAT Math Score? When you provide a test score, we compare it to scores of enrolled freshmen at each university. If a school appears in your search results, it means that you are within the range of scores recorded by half of the freshman class. Note that 25% of enrolled freshmen scored below and 25% above that range, so if you scored higher (or lower) than a school’s range, it will not appear in your search results. Also, remember that colleges that do not require or do not report test scores will be filtered out if you include test scores in your search criteria. What does the “Add to Trip Planner” button do? Go See Campus will ask you whether you want to create a new trip or add this college to an existing trip. After you have selected the option you prefer, you may either return to your search results or plan your trip. What does the “Read More” button do? Get complete details about any Go See Campus college, including admissions, size, and test scores. Where does Go See Campus get its college data? Go See Campus uses information from the National Center for Education Statistics (NCES). NCES is the primary federal entity for collecting and analyzing data related to education in the U.S. and other nations. All data is current as of the date indicated in each college’s profile. Can I get a more detailed explanation for “Degree of Urbanization”? 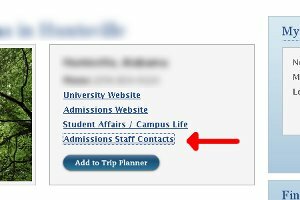 How can I find contact information for my college admissions representative? To get the information, first search for the school in which you have interest and go to its details page. If Go See Campus has a link to this school, it will appear in the box at the top-right of the screen. When you click this link, you will be led to the university's website, where you can find the admissions representative for your area. You can learn more about getting to know admissions in our Advice section. How do I plan a college trip in Go See Campus? Log into Go See Campus. In the pop-up search box that appears, type the name of the school you want to add. You can also find schools with the Advanced Search option. Press "Enter", and a screen will appear with schools that match your search. Press for schools you want to add and select your trip plan. What is the “My College Trips” box and how do I use it? My College Trips lists all of the trips you have created by name. Click on any trip to review or edit its details. Or, click “Create a New College Trip” to start fresh. How do I change the order of the places I want to visit? Click on the box that contains the college you want to re-order. Be sure not to click on any links or buttons. Hold down the mouse button and drag the college box to a new position. How do I remove a school visit from my trip? Each college in your trip has a grey tab with red writing that reads “Remove this school from your trip”. Click it, and that visit will be removed. How do I create maps for my trip? Click on the Map Creator icon. You will find it just under your trip’s name. Follow the instructions in the Map Creator. What does "New Map Creator - Testing Version" mean? Go See Campus is revamping its Map Creator tool with great new features. During this time, the new Map Creator is in testing. While the new tool will offer a lot of powerful capabilities, you may experience errors or glitches. Please let us know about any problems you experience so that we can get them fixed and get the new Map Creator in place as soon as possible! To get the latest news about our development, be sure to subscribe to our Go See Campus e-newsletter. How do I book travel through Go See Campus? To book travel, go to your trip plan. Make sure you have selected dates for each visit and how you plan to travel to each school. Select the Travel Arrangements tab at the top of your trip plan. On the Travel Arrangements screen, click the "Make Travel Arrangements" button. Select a travel provider and book your travel through that website. Why do I need to pick dates and travel for each visit? Adding these details will help you keep track of where you want to be and when. Also, Go See Campus provides you the option of booking your trip through the most trusted names in travel. Will picking dates and travel automatically book travel for me? No. To book travel, choose the Travel Arrangements tab at the top of your trip plan. I want to book flights, hotels, and car rentals for my trip. Can you help me? Go See Campus connects you to a host of travel providers that can help you book your trip. We do not book your trip for you. However, we will show you the details of your trip while you book so that you can easily get the flights, hotels, and car rentals you need. Why do I need to choose a travel website to book my travel? Go See Campus partners with great third-party travel providers to get you the services you need. All of your bookings are done through these providers. What are the different resources available to me? There are six different resources: Academic, Event, and Athletic Calendars, Campus Maps, Transit and Directions, and Parking Info. When a college does not have a particular resource listed on Go See Campus, it will not appear in the Resources tab. Why do some resources take me to the same university webpage? In some cases, different information may be listed in the same place. For example, events, like university festivals, may be included in the same calendar as athletic contests. Does Go See Campus register me for the activities in which I want to participate? No, Go See Campus does not register you for any activities at the college. We are here to help you plan your trip to visit schools and to connect you to the information you need. However, we do not contact the college with your request to participate in activities and we do not send information to the college about your trip. If you would like to participate in any activity, review information provided by the college and follow the instructions that it gives on its website. I think that a college offers an activity that is not listed on Go See Campus. What should I do? We do our best to keep Go See Campus current with college search activities offered by each school. However, if the college offers an activity through its website that falls into one of the categories below and it is not listed on our website, please provide us with a link to the page where that information is kept. In the meantime, you can create a custom activity for your trip. I want to do something on my trip that is not listed in the activities. How do I add it? Click the “Add a New Activity” button. Create a custom activity. Use custom activities to add arrivals and departures from hotels and airports, site-seeing stops, dining, and more. I have the option of adding an address for an activity. Why do I want to do this? When you enter an address, that address is added to the Map Creator. Now, you can create maps that go to and from that address. How do I find restaurants near campus? Add the college you want to visit to your trip planner. 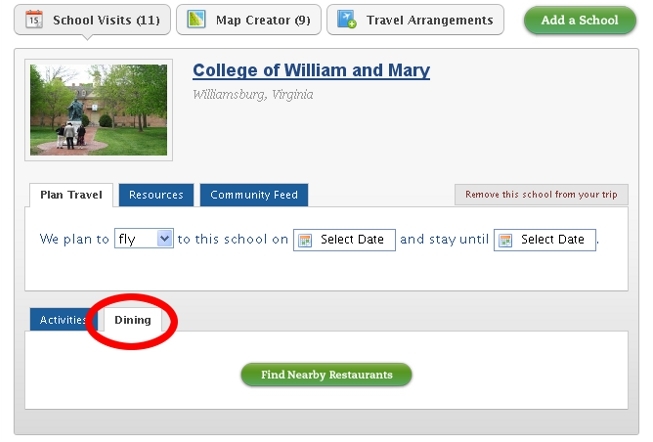 Click the "Dining" tab, as pictured below, and then choose "Find Nearby Restaurants". Go See Campus provided me reviews on restaurants from Yelp.com. What is Yelp? Yelp is a leader in “connecting people with great local businesses”. As of January 2010, the website offered 9 million local reviews. How do I move the map or see where a restaurant is located? You can click and hold your mouse button over the map and then drag it in any direction. Or, select “Find on Map” underneath any of the restaurants listed. Why should I save a restaurant to my dining list? This allows you to access that restaurant’s contact information so that you can call ahead and make reservations if necessary. Also, we provide you with the restaurant’s address in case you want to map a route to its location. How do I save my trip to my account? There is no need to do anything! All changes are saved automatically as you make them. How do I print my trip? Use “Print” option included on the trip planner page. Note that Resources for each college must be printed separately. How do I edit a trip I have created? Go to My GSC at the top-right of the screen. On the My GSC page, click on any trip you have created to begin editing. How do I delete a trip I have created? Click My GSC at the top-right of the screen. On the My GSC page, hold your cursor over any trip. Click the grey “Delete” button that appears at the right of the screen. Back to top or go to My GSC. I have something to add to the advice you give. Where can I comment? A great place to add general advice about the college search is in our Go See Campus Community. If your advice is not specific to any college, you can put your comment in one of our Advice discussion areas under More College Discussions. I have an idea for a future article for the Advice section. How can I share it? We appreciate any ideas you have! Just contact us. Back to top or go to College Advice. How can I connect with colleges? Go See Campus puts you in touch with universities through its "Connect to Colleges" feature. We will notify users when this program is active. Back to top or go to College Resources. 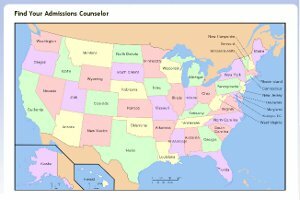 What opportunities are available for high school college counselors, educational consultants, and college representatives? Explore our page for professionals to learn how Go See Campus can help you in your work. There, you will also find tools and resources that can support you in planning campus visits. What is "Share Your Story?" and how can it benefit me? Do you want to reach a wider audience of students and parents? Go See Campus is interested in learning stories about how you and your students have benefited from our website. Let us know, and you and your company or school could receive coverage on the site, in the media, and elsewhere. See the top of our Professional webpage to get started. Back to top or go to the Professional webpage. Who participates in the Community? All registered members of Go See Campus are invited to participate in the Community. This includes students, parents, and experts in the college search. Where can I find guidelines for how to participate in the community? All guidelines are located here. Do I have to sign in to use the Community? You can read any public content in the Community without signing in. However, we require that you register and sign in if you want to make submissions to the Community. What is a Community name and why should I create one? The Community Name is an alias that appears in place of any personal information. It allows you to submit questions and other content without revealing personally identifiable details. For example, Jane Smith might choose the Community Name “BlueSky”. As a result, other users will only see “BlueSky”, not “Jane Smith”, next to her submissions. If you prefer to use your real name as your Community Name, remember that content you post on Go See Campus is available to all users, including reviews and comments you make about universities. How do I change my Community Name? Enter a new community name and press “Update Profile” at the bottom of the screen. Click “Display Name”, and select the new Community Name you have created. Press “Update Profile”. Your new Community Name will now appear when you submit. Why are some Community members marked as “Professional”? Professional members are users of Go See Campus who offer services related to the college search. Professional members are required to abide by our code of conduct so that other members receive the best information possible without being spammed or contacted inappropriately. How can I contact a professional member? All professional members are available through the private messaging feature in the Community. Also, you can click on the Community Name of a professional member and see information about their business. How can I become a professional member? An owner or representative of a company who wants to share business information or conduct commercial activities through Go See Campus must register as a professional member when they sign up initially. If you have registered as any other type of user, you can change your status by contacting Go See Campus. Back to top or go to the Community. What is the Campus Bookstore? The Campus Bookstore is a great place to find guidebooks and other resources to help you in your search for the right school. Also, there are plenty of items that will be useful on your trips to schools. Does Go See Campus sell or ship my purchase? Who should I contact about my purchase? Please address all questions and concerns about purchases to Amazon as per its guidelines. Does Go See Campus host online opportunities for learning about the website? Glad you asked! From time to time, Go See Campus presents free webinars tailored to specific audiences, like students and parents, high school college counselors, and educational consultants. The current webinar information is listed below. Sign up early to save your seat! "Planning Campus Visits Online Using Go See Campus (For High School Students and Parents)": Wednesday, March 9, 8:00 PM-9:00 PM EST. "College Search Resources and Campus Visit Planning with Go See Campus (For High School College Counselors and Educational Consultants)": Wednesday, March 9, 12:00 PM-1:00 PM EST. I'd like to share this online training information with my friends / students / clients. Is there any easy way to do it? Just copy, paste, and send the information below. Go See Campus (http://goseecampus.com) is the free website that lets you plan your campus visits online. The site's College Trip Planner connects you to campus tours, information sessions, and other admissions activities and helps you create itineraries to take on the road. - Mapping your route and getting parking, restaurant, & travel information. Limited space! See http://goseecampus.com/help#online-training for dates and times. If your question is not answered in our Help section, please contact us.